There are many barriers that prevent Asian women from seeking timely medical attention for mental health and disease prevention. They struggle with acculturation, societal stigmas, and socioeconomic factors. Consequently, cancer deaths are increasing faster among Asian women than any other U.S. ethnic or racial group. AWFH plays a critical role in promoting health equity in diverse communities and increasing access to quality care and culturally relevant resources for underserved women. Survivors of cancer and personal trauma can find hope, healing, and empowerment through a peer network that is built on shared personal experiences, empathy, and mutual support; the results are decreased hospitalization, suicide prevention, and an emphasis on overall holistic health. AWFH also influences the community dialogue around women’s health and wellness by engaging service providers and policy makers in their mission. Countless survivors of cancer and personal trauma move away from a sense of isolation to a community that supports them to lead healthy and fulfilling lives. Many give back to others by becoming peer health educators, advocates, and ambassadors for AWFH. EDUCATE: Education is the key to good health. AWFH provides culturally and linguistically appropriate information and training to dispel myths, increase health literacy, and improve health communication. ADVOCATE: Advocacy is crucial in promoting health equity. AWFH works on policy at all levels to push for disaggregated data, and support equitable funding for impacted populations. RECIPROCATE: Reciprocation is essential for growth. AWFH fosters a nurturing environment for collaboration, connection, and capacity-building. The funds we raise will help support various programs, including: free breast and cervical cancer screenings, an annual Asian Mental Health Forum, data studies to inform policy makers on emerging health issues in the Asian community, and creative forums for women to connect and uplift each other. Join us in our cause for this year and let’s stand not only WITH survivors, but FOR survivors today. 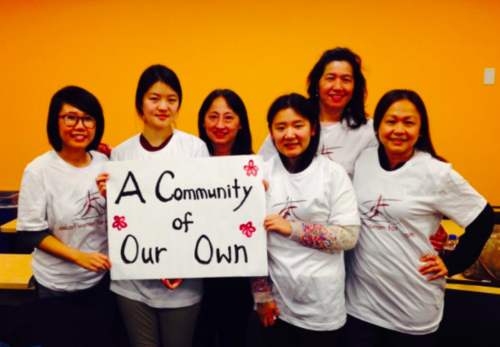 Even a small donation from you can help Asian Women For Health expand their reach and serve more women and families. Our cause for 2017 is to use our competitive milestones to help support our seniors. Senior population is among the fastest growing population segments in the U.S., bringing with it a growth in the number of our seniors who are living in solitude and hunger. Approximately one in three seniors are at risk of being socially isolated, disconnected from their communities, from their social networks, and are at risk of premature or unnecessary institutionalization in hospitals or long-term care facilities. Our hope this year is to bring together competitors who can channel their compassion and kindness towards helping our elderly who remain neglected and lonely. The devastation caused by hurricane Harvey in Houston has put our seniors in the area at greater risks of hunger, loneliness, and deprivation. We will donate all the funds we raise this year to help our elderly in Houston through our charity pick Meals on Wheels for Greater Houston. Meals on Wheels provides home-delivered weekend meals and a week’s worth of breakfast to over 1,100 disabled adults and seniors in the area. This nutritional support helps these seniors stay independent and in their own homes. We hope you join us and use the gift of our health, good fortune and blessings to lend a hand to our most frail and vulnerable sections of society. A small amount of your generous donation can go a long way – even a single meal and a friendly visit can brighten up someone’s day and give them hope for a better life. Competing for a Cause teamed up with the 501(c)3 Dancing Dreams in 2016 to raise funds to provide weekly dance therapy classes for low income children with physical and/or mental disabilities. The classes allow the dancers to experience the joy of expressive movement, music, and the fitness qualities that make dance to powerful and therapeutic. Dancing Dreams also employs teen volunteers to assist with classes in an effort to foster leadership skills, increase awareness, and enhance tolerance for those with physical challenges. Along with community outreach programs, Dancing Dreams also hosts an annual recital for the dancers where they can boost their self esteem and perform for an audience. Living in underprivileged rural environments makes children more vulnerable to exploitation, abuse, violence, discrimination and stigmatization. In 2015, we selected two charity programs in India, namely, Sarada Kalyan Bhandar and Vivek Chetana. Sarada Kalyan Bhandar (SKB) is devoted to serving the poor and under-privileged communities in India. SKB will use our funds towards their Child Welfare Project, where approximately 700 students will be able to get study materials towards basic education, school uniforms, meals, and participate in extracurricular activities. These children come from 12 undeveloped villages in India, where their families are poor laborers who are unable to meet the food and other basic needs of their families. SKB will also be able to enroll 4 additional children under their Girl Child Efficiency Development Scheme, where talented children from poor families are given an opportunity to further develop their talents and grow to their full potentials. Finally, our funds will also help to provide a home, food and basic schooling to 34 orphaned children. Vivek Chetana (VC) is a voluntary women’s social welfare organization founded on Swami Vivekananda’s ideals of love and service and is committed to the empowerment of distressed women and children. VC will use our funds towards a program that provides non-formal education and a support center for homeless street children. VC also works to motivate (and help enroll) these children into more formal education programs and provides them with regular meals. Our contributions will used towards the support, education and meals for approximately 45 children over the next year.